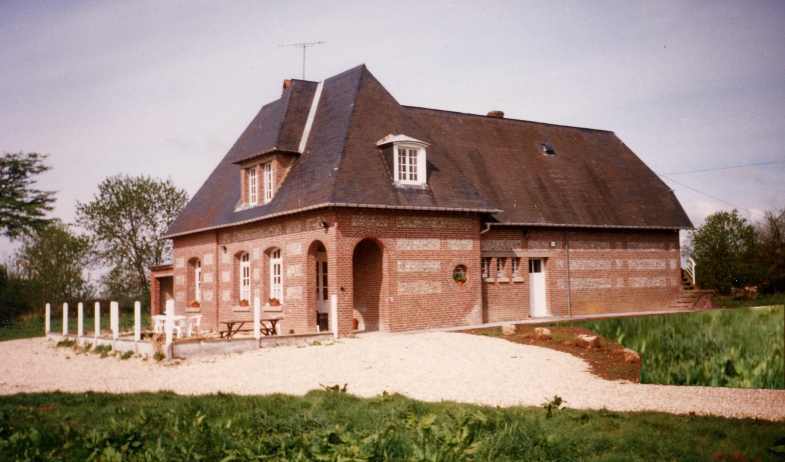 St Vaast du Val in High Normandy : pleasant and comfortable flint and brick house (3 ears Gîte de France, adapted for disabled, 182m2 habitable), for 15 people, in large and privative farm yard bordered by planted banks, swings, ping pong table, outside furniture, barbecue. Ground floor : sitting room 18m2 (pool table, TV, tel, wood burning stove), dining room 30m2, fully equipped kitchen (dishwasher, washing machine), shower, toilets, playroom (toys + 2 single beds). Upstairs : 5 bedrooms (5 double beds + 8 single beds + 3 cots, blankets and pillows), shower, toilets,. Equipped for babies. CH. Sheet rental available 7€. Fixed supplement for cleaning ( 70€ ). Directions : at the traffic lights in Tôtes center, take the N29 towards Yerville, and after 1 mile tum right towards St Vaast du Val on the D25, go through the village and at " Glatigny ", turn left at the Normandy styled bus shelter; the gîte is at 200m on the left : 8 rue aux mares. Rate 2016: 640€ at 880€ per week (+expenses). 520€ expenses included for a WE (Friday to Sunday). 25% deposit for the rental on réservation (chèque or bank transfer). Full payment due 1 month before arrival. Deposit 800€ against damage required upon arrival.